Greetings from the coast of Normandie! Summer is a good time to view and review classic films. It is in this spirit that I begin a commentary on Alfred Hitchcock's 1951 masterpiece, filmed by his longtime cinematographer, Robert Burks, ASC. If you haven't seen the film I strongly encourage you to do so, it's a masterpiece of world cinema. I should also warn you that I will be giving away the ending in subsequent posts. But for now, let's look a the beginning of this masterful film. This is a memorable opening. 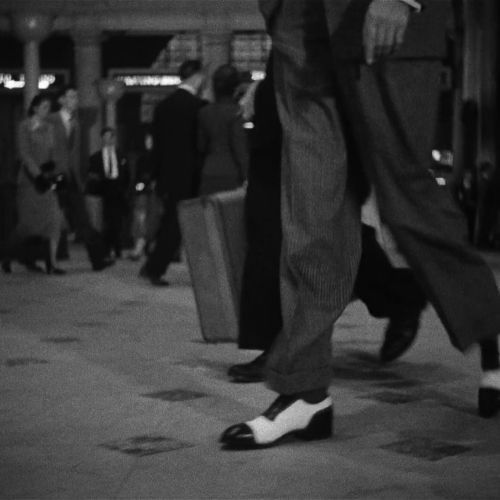 The film introduces the two characters with their shoes: first a pair of showy two-tones, then the plain shoes of a man with two tennis rackets. Each pair is accompanied by its musical theme. The two pairs of shoes are set on a collision course, repeatedly moving in opposing screen directions towards each other: the two-tones moving left, and the plain shoes moving right. Then the shoes enter the gateway to the train a few people apart. 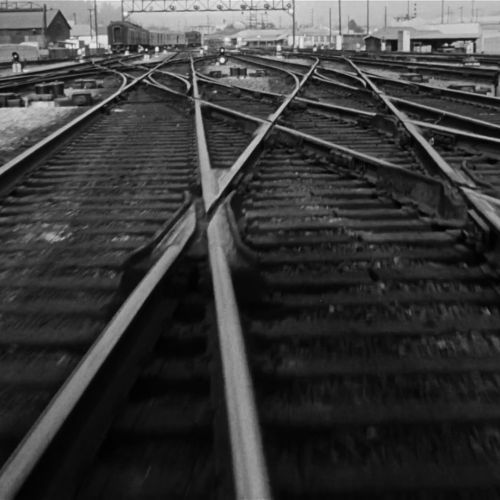 This unusual shot visually announces the movie's themes: two paths crossing, but also the choosing of one path over another, it also tells the viewer that the train has left the station. The shot dissolves to the inside of the train, to a dolly move following the two-tone shoes on its leftward journey down the aisle of the parlor car before sitting. We then cut to a dolly in the opposite direction of the plain shoes walking rightward and sitting. The shoe sequence ends with a close-up of the plain shoe swinging up to bump into the two-tones. The first 2 1/2 minutes of Strangers on a Train introduces two characters: a flashy guy and a plain tennis player, and shows the audience that their paths will cross. This is a form of dramatic irony: the audience knows that these two people are destined to meet, and to clash, but the characters are unaware. 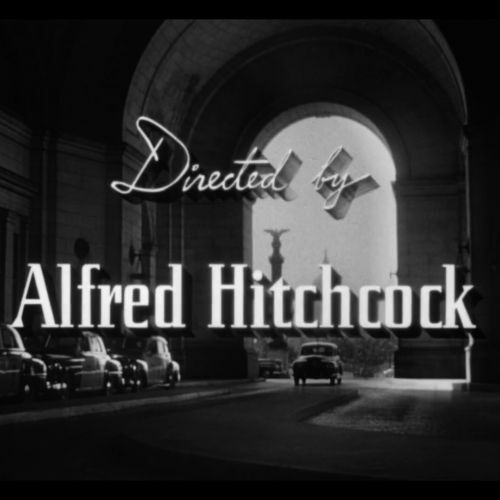 This is a frequent approach for Hitchcock to build suspense. The sequence also intrigues the viewer by withholding information. Who are these strangers? What do they look like? 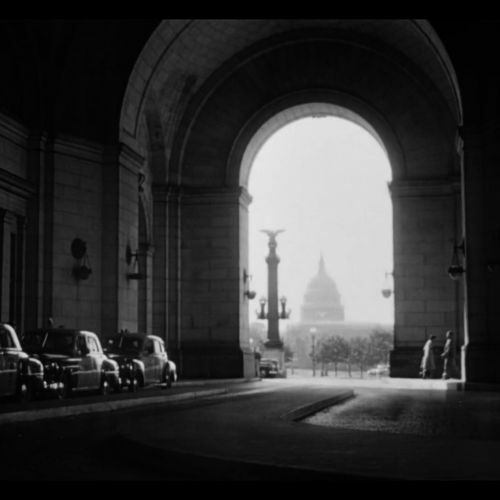 The opening sequence has suspense with a note of humor, both Hitchcock trademarks. The shoe bump, a minor chance occurrence that sets the story in motion. The ordinary shoes on the left belong to the hero, Guy. The two-tone shoes on the right belong to the bad guy, Bruno. It's interesting that throughout their first meeting, in the parlor car and then in the compartment, Guy will be facing right and Bruno facing left. This kind of simple graphic rule is another Hitchcock trait. The wide shot that reveals Guy and Bruno. After the set of shoe shots, the first static shot shows off the intricate art direction of the parlor car set, and gives us a first taste of Burks' lush cinematography, with a wide range of grays, anchored in strong blacks. We shall return to this in the next post. 1. 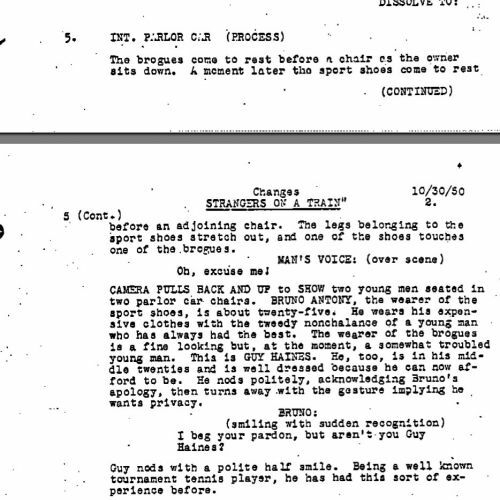 On screen we see the two-tone "sport shoes" first, and the plain "brogue" shoes second, the opposite of the script's order. 2. 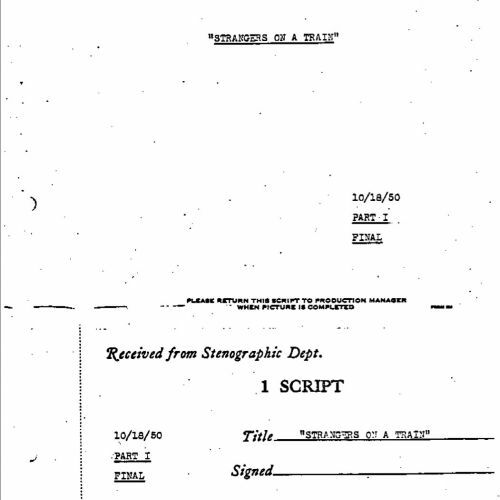 In the script the two characters arrive in the same place. On screen Bruno arrives in a dark interior, while Guy arrives in a bright outside. 3. In the script the two follow each other, on screen they come from opposing sides. 4. The script does not mention a shot of train tracks. 5. 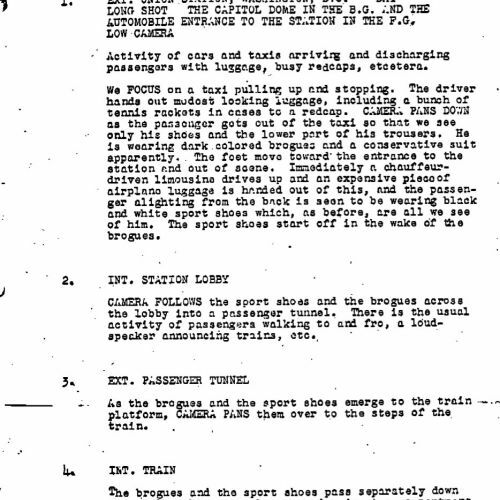 The script shows Bruno entering his compartment before coming to the parlor car. Not so on screen. 7. On screen Guy's shoe hits Bruno's, the opposite of the script. To my mind, the screen is better than the script for all of these points, perhaps reflecting a refining process by the filmmakers. Starting with Bruno highlights his importance to the film. I will argue later that the bad guy may be the movie's real hero. 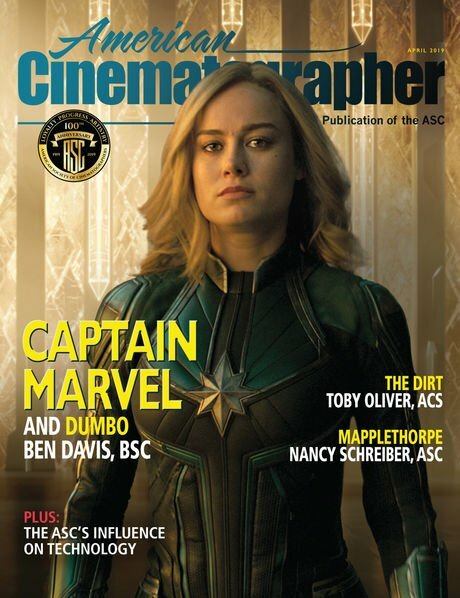 Having the two characters move towards each other -- instead of following one another -- uses screen direction to herald the conflict between them that will create the drama of the movie. I believe that the last three points are important because they make it clear that Bruno has not planned his encounter with Guy, since it's Guy who happens to sit opposite him and bump his shoe. 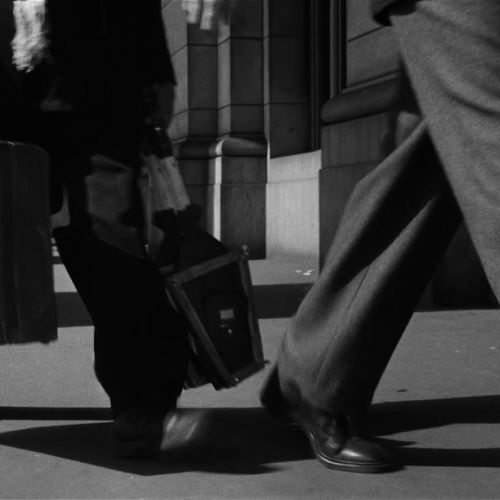 In Hitchcock's movies the hero is often an ordinary man who seems to be destined for extraordinary drama, often by means of a chance occurrence. 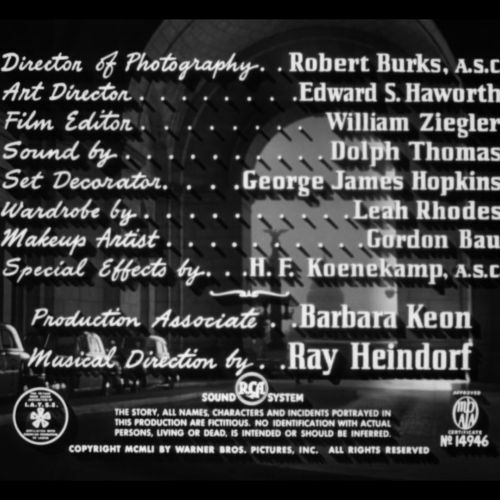 In any case, these differences indicate that, though Hitchcock was clearly extremely prepared before production, he may well have made changes on the set and in the editing room. In 1962, French director François Truffaut spent several days interviewing Hitchcock about his work. The result of their talks was the book Hitchcock/Truffaut, which I highly recommend. 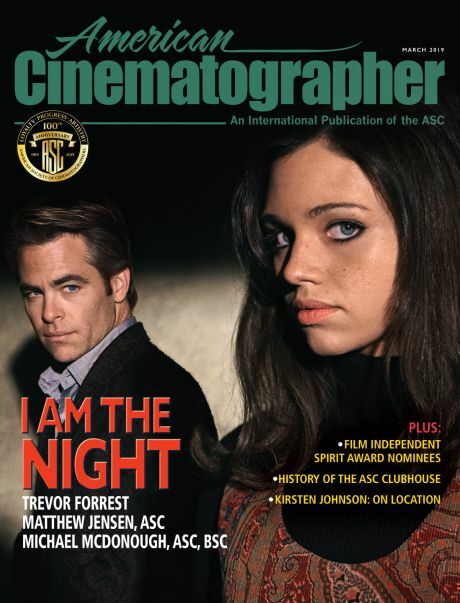 It's rare to have two great filmmakers discuss filmmaking for publication. Alfred Hitchcock speaking to François Truffaut in 1962. In his introduction to his book, Truffaut states: “because he exercises such complete control over all the elements of his films and imprints his personal concepts at each step of the way, Hitchcock has a distinctive style of his own. 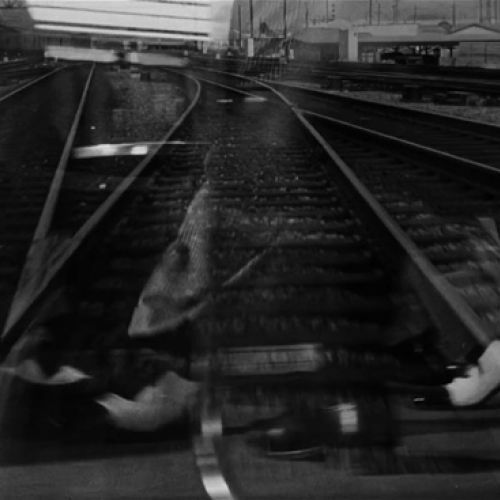 He is undoubtedly one of the few filmmakers on the horizon today whose screen signature can be identified as soon as the picture begins.” The first 2 1/2 minutes of Strangers on a Train bear this out. There is undoubtedly some truth to the auteur theory. Hitchcock was a genius, but surely part of his genius resided in surrounding himself with brilliant key collaborators, and notably cinematographer Burks, who worked on a dozen of the master’s films, including Rear Window, North by Northwest and Vertigo. Burks' own mastery is key to what we identify as the Hitchcock look: in this case, crisp black-and-white photography with strong contrasts and moments of dreamy expressionism. 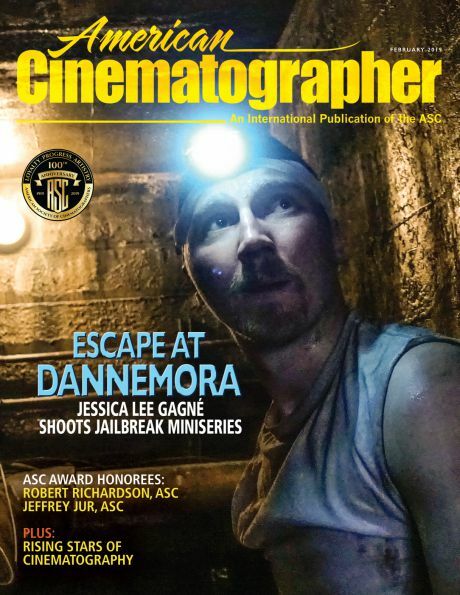 Burks was nominated for a cinematography Oscar for Strangers on a Train. But we're getting ahead of ourselves. Once again, if you haven't seen the film, I encourage you to do so before my next post in two weeks' time, which will continue my commentary of Strangers on a Train. Alfred Hitchcock and his longtime cinematographer, Robert Burks, ASC.